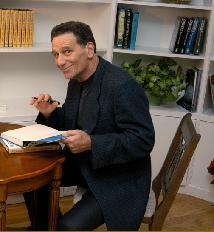 Writer, producer and attorney in no particular order, Weiner wrote the novel Prisoners of Truth (2004, 2006 pb ed., Council Oak Books), co-authored Kinship With Animals an anthology of true interspecies encounters from well-known animal activists, scientists and other professionals (2007, Council Oak Books), co-edited Resistance - a Radical Political and Social History of the Lower East Side by Clayton Patterson (2009, Seven Stories Press), co-managed publication of Vali Meyers-a Memoir by Gianni Menichetti (Golda Foundation Press); he was consulting producer and wrote additional dialogue for Hoodwinked Too; Hood vs Evil (animated feature film 2011, TWC); his original comedy screenplay, Heck No is in development. Born and raised in Chicago, IL, Weiner began his legal career defending criminal cases in state and federal courts. Since moving to San Francisco, he continues to practice law concentrating on all manner of civil advice, disputes and their resolution. His clients have ranged from an inventor of the MRI machine to a death row inmate, from an NBA All-Star to Koko the signing gorilla; he regularly donates legal services to those in need. Contemporary American painter and multi-media artist, her work has hung in galleries, museums and juried exhibitions across the United States, Europe and Asia. Thought-provoking and innovative, Calef’s mixed media & oil "peoplescapes" combine vibrant expressionistic hues with sculpture and found objects, giving her characters third-dimensionality while cleverly addressing social and political world issues. "When I first saw Nancy’s paintings, I thought `Now here’s an original idea.’ As a traditional, old workhorse I don’t have much use for and don’t believe in classifying contemporary art. I do think that a picture should say something, and Nancy Calef’s subject matter and palette express a view of the world beyond her years." While evoking comparisons with Red Grooms, Reginald Marsh and George Grosz, Calef's paintings have appeared in ArtNews, Gallery Guide, on book covers, CD covers, in metropolitan newspapers, print and on-line magazines; incl. Smithsonian Women Artists Directory. Nancy is a singer-songwriter and certified computer animator. Nancy and Jody began their personal and creative collaboration in San Francisco, 1989; married in 1993, they continue to reside, work and travel together.